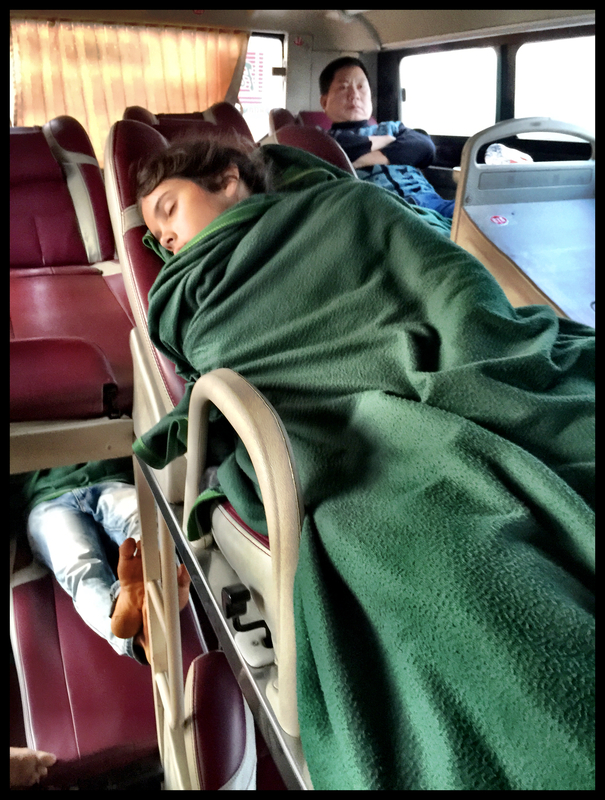 Grand Tour 2015 #15; The Sleeper Bus Episode; One long, long journey into the night. The kids were excited. I was a little bit scared. 16 hours in a space designed for someone about 16 inches shorter than I was one thing. 16 hours of driving on Vietnams roads was another. It’s obviously not that dangerous driving in Vietnam but its not that much fun either especially when you are responsible for putting your family in that situation. There were possiblities of hiring car and driver but with two vegetarians and one 8 year old thats not at all partial to vietnamese food in general and opposed to pig eating on principle the slow road through the mountains was out. So we wanted to get out of Dalat after staying 3 extra days. A car to the coast would be good but the triple mega public holiday combo meant that then we would have to wait in Nha Trang or may be Phan Rang-Thap Cham for 4-6 days before we could get a sleeper cabin to go north. There is a lot of Vietnam to see and already a month was looking way too short. I wanted to get to Hoi An. 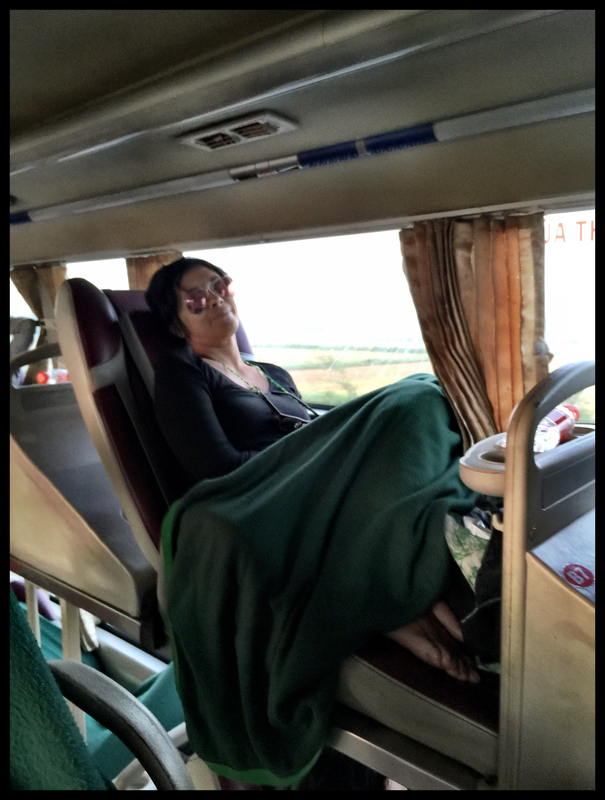 There was a 16 hour sleeper bus to Danang. It was not a tourist service. The smiling people at the bus station didn’t speak much english. There were 5 seats left when I found out. One went while I was trying to call the hotel to see if the family was up for it. I jumped on the bus. Metaphorically initially but literally the next day. The next day was the 30th of April. We’ve touched on the historical significance of this date before. We were travelling on the 40th anniversary of the surrender of the South Vietnamese Regime. Would the entire nation be drunk? From experience an equivalent celebration in Ireland would engender nationwide drunkenness. Similarly rice spirit would have been consumed by the gallon in Laos. Should be gambling with this? Certainly all the traffic cops would be on holiday. 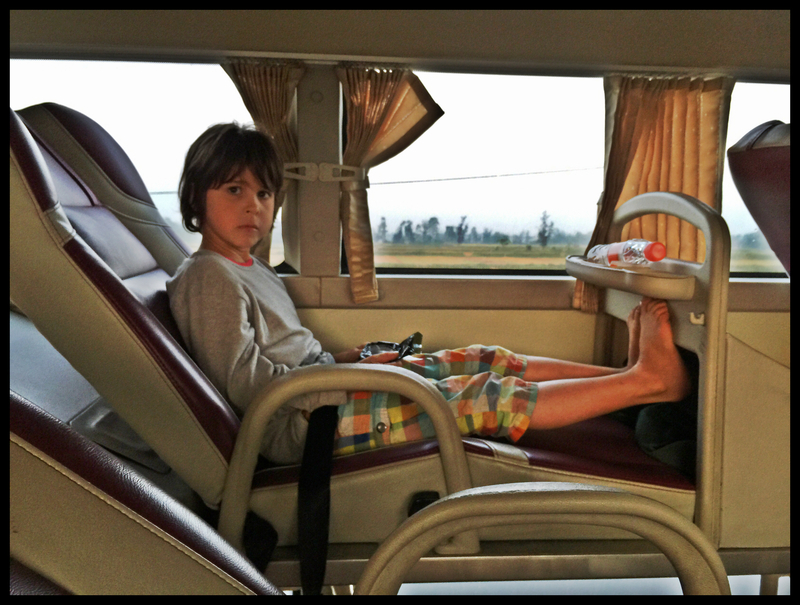 Sleeper bus travel in Vietnam is a steep learning curve for anyone and a little steeper when you multiply your foibles by 4. Our kids are new to this so we wanted to be together. This was nearly possible at the ticket desk; we got seats pretty close together all on the upper level. When we got on the bus we didn’t get those seats. We were seperated. The kids dealt with this much better than I would have expected but I was a bit annoyed. One person swapped and we got by. Futa tell you not to get a taxi and that they will send bus to get you. We were ready early. Two hours later they arrived at our accommodation in a mini-bus after the bus had actually departed the bus station. We were shouted at by a stressed mini-bus driver who proceeded to drive in a manner that really frightened us all. This was unlike any other driving we were exposed to in Vietnam. The chap was being shouted at down his phone all the time. Someone had messed up and we were trying to catch up with the bus. I have had the pleasure of being a Formula 1 Fast Medical Response Team Doctor which involved some very fast driving. I’ve travelled all over South America, South-East Asia and India. This should have been a dull transfer. It was not. When we caught the bus, on some random roadside in the rain, our bags were precariously squeezed onto the top of a packed luggage section. I insisted on watching them get loaded. The boys weren’t happy. Neither was I; every time that door would be opened our bags would fall out; think over-full over-head locker in an airliner. The family were pushed on the bus, it started moving before I was actually in the door, everyone fell over at least once before we got to our seats. Dominique was furious. The kids were laughing. 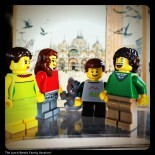 I focussed on the kids.The actual trip wasnt that bad. Everyone got some rest except me. Just a size thing mostly. I am 6ft 2inches and I was just too long for my seat. Food stop was average. The toilet stops were not at toilets. Try selling roadside micturition on Highway 1 to your significant other. The locals babies were unbelievably quiet. There was a 90 year old man that was on an upper bunk. Up he went, down he went, up he went, down he went. It’s hard to complain like a molly coddled westerner when you see this. We had tickets to Danang but when the ticket collector guy on the bus asked where we were going I said Hoi An. Because thats where we were going. Its only 30 minutes drive from Danang. The bus was going past it on the way. We were awoken and hustled off the bus at an empty junction at the road side at 06:00. Our bags were pulled out and dropped on the dirt. The bus started moving before I had alighted. Thankfully it was me last on and last off each time. I think the ticket collector was actually trying to help; to save us the trip back from Danang down the same road. Nonetheless I prefer getting on and off a stationary vehicle. Maybe I am being a little precious. We were in the middle of nowhere and accosted by a group of very friendly but very drunk motorcycle riders that wanted to bring us to Hoi An. An inauspicious start to our sleeper bus career. Or to put it another way; a spectacular end to our sleeper bus career. Give me a train every day and every night. You just had to hold on until they stopped and that’s when the fun really starts! Sweet Jesus! Next time travel with She-pees for the ladies. I look forward to Dom’s retelling of this trip… Or not. I couldn’t remember the name. There must be half a dozen of that sort of thing out there! I’ll have to educate myself on this crucial matter! I did a sleeper train experience that was almost like yours, in Vietnam, too traumatised the remember destination. topped only when they brought round a cart of cooked chicken babies still in the egg, (and cut in half) for sale. Really tricky, easy one for you – you wouldn’t eat it whether it was an end if a chicken. ( is it really a chicken if it hasn’t been born, or it is still an embryo?!? Bit like the abortion debate! But since it was also cut in half coronally, it is a mute point. Smell still sticks in my mind! Keep on writing, enjoying with you, from afar! We think of you all lots! Ah yes. The half a chicken embryo delicacy. Not a fun thing to start thinking about. Friends of mine raise chickens. Even if one is raising chickens just for eggs it helps egg production to keep a rooster. Eggs collected each day may be fertilised but the embryo is very tiny. It looks and tastes like a normal egg. A red spot if anything. Is that better or worse than the developed chick inside an egg? The more you think about it the more attractive Veganism looks. 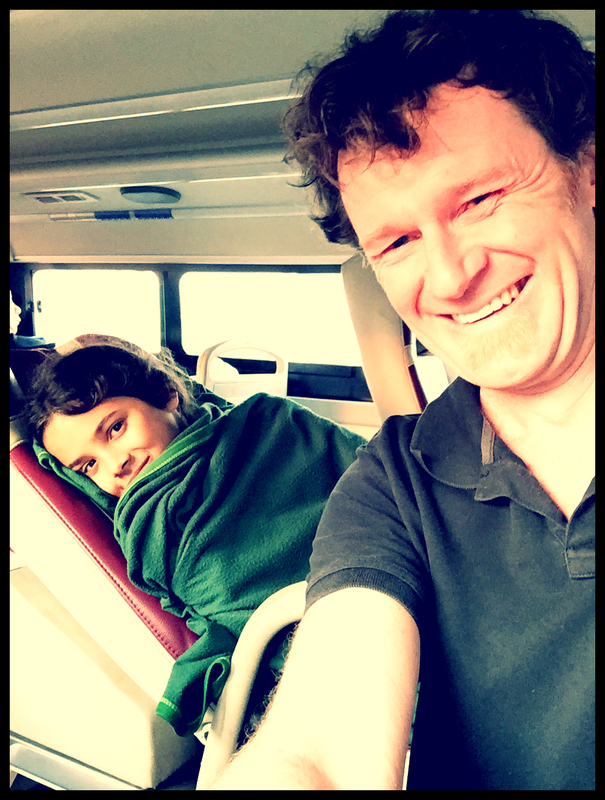 This entry was posted on 15/05/2015 by dougalynch in Grand Tour 2015 and tagged Arrowhead Equipment, Dalat, Dangerous, Grand Tour 2015, HammockGear, Hoi An, kids, Kids Travel, Sleeper Bus, Travel, Vietnam.